You really can make your own applesauce. It’s surprisingly easy! Even if you’re on a budget and don’t have lots of fancy tools it’s not difficult to make it work. If you can get a WONDERFUL contraption like This One, then apple sauce…and any other sauce, will be even easier! 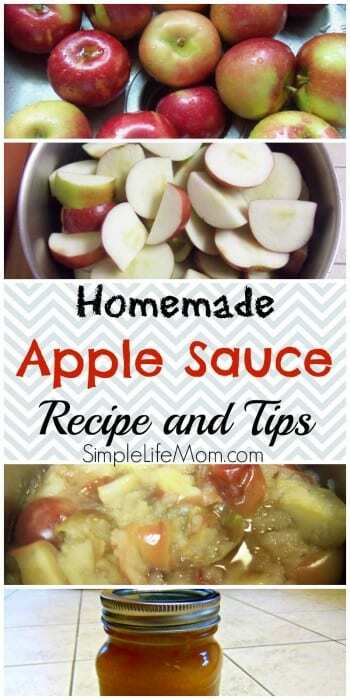 Again, I’m sure there are many methods out there to make your own applesauce, especially when you consider the different gadgets that people have for pealing, juicing, coring, etc. This is my method. No gadgets. Just a pot and a knife. Add 2 inches of water to the pot and the juice of 1 lemon. 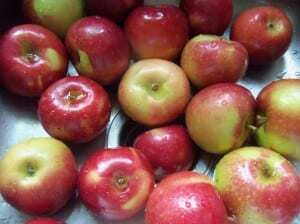 Cook apples until they are soft, 1- 2 hours depending on the temperature. I like to get them before they're completely mush, where they still have a little texture. Some people add a little brown sugar at this point. I like to just add cinnamon. If you have removed the peels, just crush with a potato masher if necessary and add to sanitized jars. If you left the skins on, just add the mixture to a blender and blend. Place jars in freezer or fridge, or process jars for canning (Put hot mixture in jars that have been boiled. Seal with lid and boil in water for another 5 minutes. Let cool and lids should pop down). 1) Wash apples. You can use as many pounds as your pot or slow cooker can fit. Any apples will do, but sweeter apples are better. You’ll find different apples will have different textures as well. 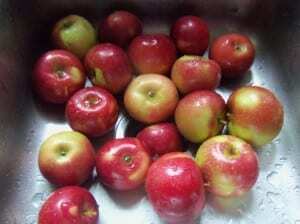 2) Core apples. You can peal them if you want, but you don’t have to. By not pealing them you will be retaining all those wonderful nutrients in the peal. 3) Add about 2 inches of water or apple juice to the pot, and the juice from one lemon. 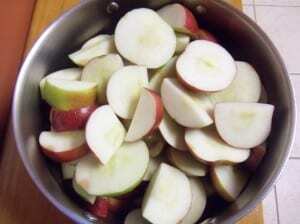 4) Cook apples until they are soft, 1- 2 hours depending on the temperature. I like to get them before their completely mush, where they still have a little texture. Some people add a little brown sugar at this point. I like to just add cinnamon. 5) If you have removed the peals, just crush with a potato masher and add to sanitized jars. If you left the skins on, just add the mixture to a blender and blend. 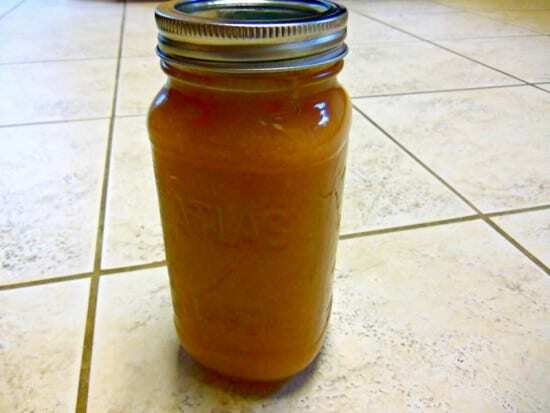 6) Place jars in freezer or fridge, or process jars for canning (Put hot mixture in jars that have been boiled. Seal with lid and boil in water for another 5 minutes. Let cool and lids should pop down). 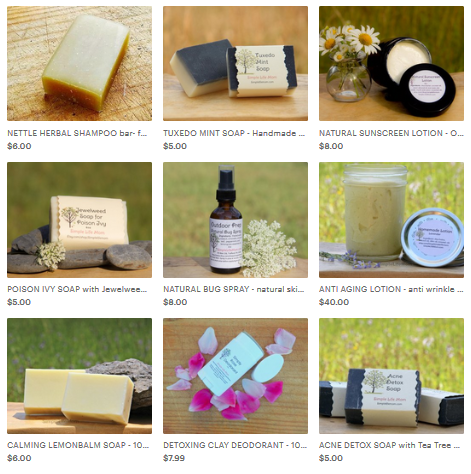 Shared on some of these great blogs. Please share in your circles as well. Thank you! Hadn’t realised you could leave the peel on and then just blend it – great tip, thanks! Been looking for a homemade applesauce sans sugar. Hello! I nominated you for a Liebster Award! 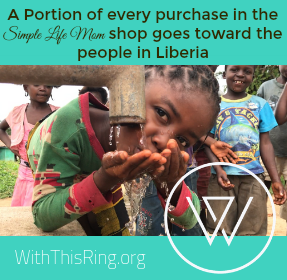 Please check out Sweet Fling for details! This fast-forwards me to one of my most cherished fall traditions: making homemade applesauce with my daughters and my parents! Together, we make a total of about 75 quarts, so we use a Victorio Strainer…hello to all the good stuff, goodbye to all the bad in a few (okay, more than a few) cranks! 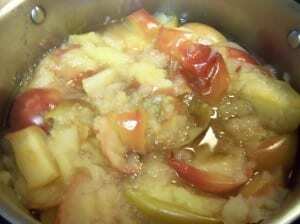 There really is NOTHING that can replace or replicate homemade applesauce, is there? 🙂 Stopping by from Full Plate Thursday! Look forward to the apple sales so I can try this recipe!